Sony's Venom trailer has seen some pretty funny fan edits over the past few months, but the latest mashup with 1997's Flubber is taking things to a whole new level of hilarity. Robin Williams and Tom Hardy merge the symbiote with Flubber, taking the drama and terror out and replacing it with fun. However, it certainly makes Flubber look like a dark and sinister movie in comparison. There's a lot going on in this new mashup and it truly needs to be seen to be fully appreciated. Separate from each other, Robin Williams and Tom Hardy play characters who discover a brand-new mischievous substance that seems to have a mind of its own, which leads to some pretty funny encounters in this Venom and Flubber remake. Hardy's Eddie Brock getting taken over by Flubber is certainly a lot more tame that the symbiote, though it already looks like the green substance is putting Brock in some awkward situations. Williams' Professor Philip Brainard seems perfectly happy that his invention is out in the world, taking on the role of Riz Ahmed's Dr. Carlton Drake. While nobody ever really saw any similarities between Sony's upcoming Venom movie and a 1997 Disney film starring Robin Williams before, it's now hard to un-see. Watching the symbiote completely take over Eddie Brock into a green glob and licking the face of an attacker is pretty much perfect, especially when he says his name and it's the voice of Robin Williams shouting, "Flubber!" It cannot be stressed enough how well these two movies work together. Hopefully a fan will take on the challenge of making a full-length mashup when Venom is released on Blu-ray. Disney's Flubber is a remake of 1961's The Absent-Minded Professor and starred Robin Williams as Professor Philip Brainard. The film took many of the same gags from the source material along with some of Williams' uncanny quick adlibs that made it into the final cut. The movie was a modest success at the box office, earning $178 million worldwide, but it was not loved by critics and currently holds a 24 percent Fresh Rating on Rotten Tomatoes. Venom should be able to make some more money at the box office and secure better reviews. Sony's Venom hits theaters on October 5th, but sadly, it won't contain any of the fun Flubber references. All kidding aside, the Ruben Fleischer-directed film and Shane Black's The Predator have all been looking better and better after the release of the latest trailers and TV spots. Venom seems like it may be the dark version of the character that comic book fans have been waiting to see on the big screen for years. Additionally, there's the teases of Carnage and the possibility of even seeing She-Venom in a another installment, so the future is looking bright for a franchise at this time. 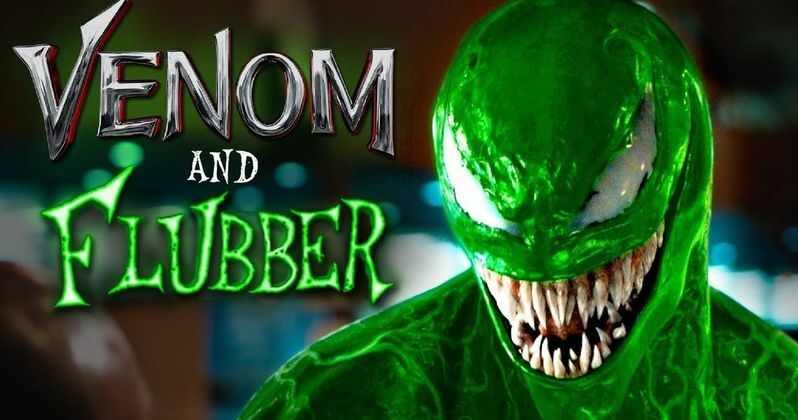 For now though, we have the Flubber and Venom mashup, which you can see below, provided by the Nerdist YouTube channel.